Last night I read that our bodies crave different colors at different times ("Light Emerging - The Journey of Personal Healing" by Barbara Ann Brennan). Since I began quilting, it seems my body just plain craves colors in all its fiber varieties: bright or subdued, busy or calm, old fashioned or super modern. Against any background, as long as the colors dance before my eyes, my body dances, too, and my spirit soars regardless of what may be happening around me. "Easy Layer-Cake Quilts 2: More Simple Quilts from 10" Squares" by Barbara Groves and Mary Jacobson, recently published by Martingale, has had me dancing from the moment I saw its cover! The book features 11 projects made with Layer Cakes - must-have! 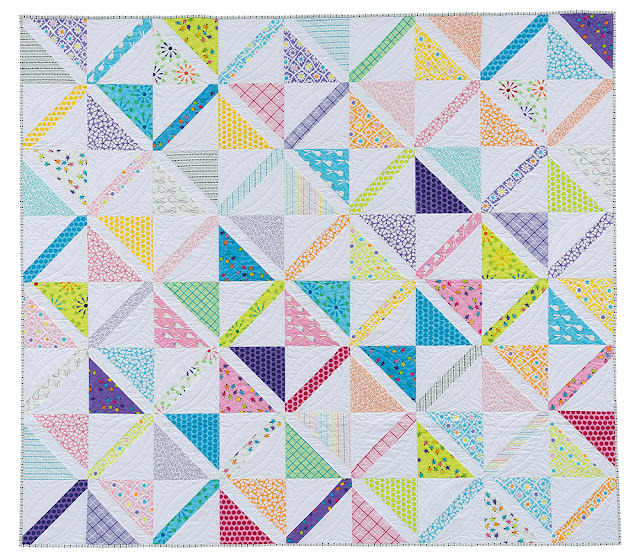 Add a little bit of yardage and you have all you need for beautiful, colorful quilts requiring the skills of advanced beginners and one weekend. "Daybreak", above, is the last quilt in the book but the first one I saw as I peruse books beginning at the back cover... What a happy quilt and ideal to display those prints we do not want to cut into tiny pieces. 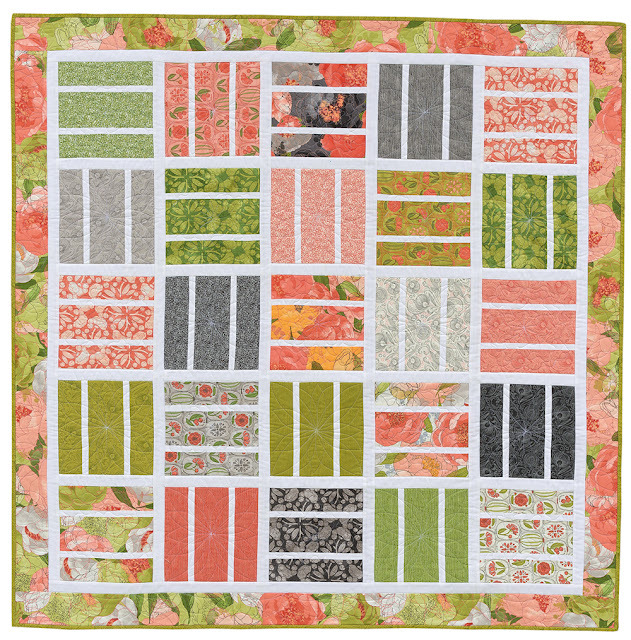 The Layer Cakes provide enough of each fabric in a collection to ensure our quilts have a great mix of textures, values, and print scales. Barbara Groves and Mary Jacobson expertly use this variety in their designs teaching us how we can achieve the same wonderful results as we use our own stash of fabrics, pre-cut or not. I like that Barbara and Mary suggest how we can use leftover triangles in other projects, and the many other tips we get throughout the book. You see, sometimes one little tip can make all the difference in our quilt-making journey so I always make sure I read them all. I feel as if they were granting us a personal interview ("How did they know I was wondering about that?" is what I ask myself often as I read those tidbits). 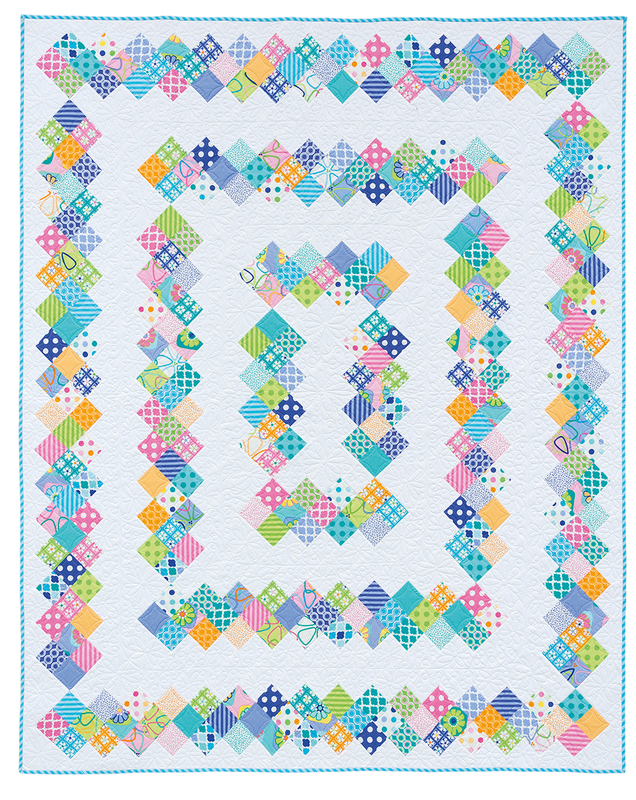 "Around the Block", above, is such a fun design with a fantastic explosion of color. Just make sure there is a lot of contrast between the prints you choose and the background, and your quilt will be a gem! I also noticed that almost all the projects show cool textured fabrics on the binding. You can tell Barbara and Mary have a lot of fun designing the projects for their books, putting a lot of thought into every aspect of the process. All the hard work is done so we, quilters, can just cut, sew, and snuggle. Snuggling is what I feel like doing because we have wind and snow raging outside to make life interesting today. All the more reason to go through Easy Layer-Cake Quilts 2, choose one of the projects, and focus on colors! How about a giveaway today? 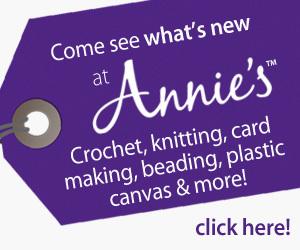 Leave a comment to let me know which one you purchase more often - yardage or precuts. 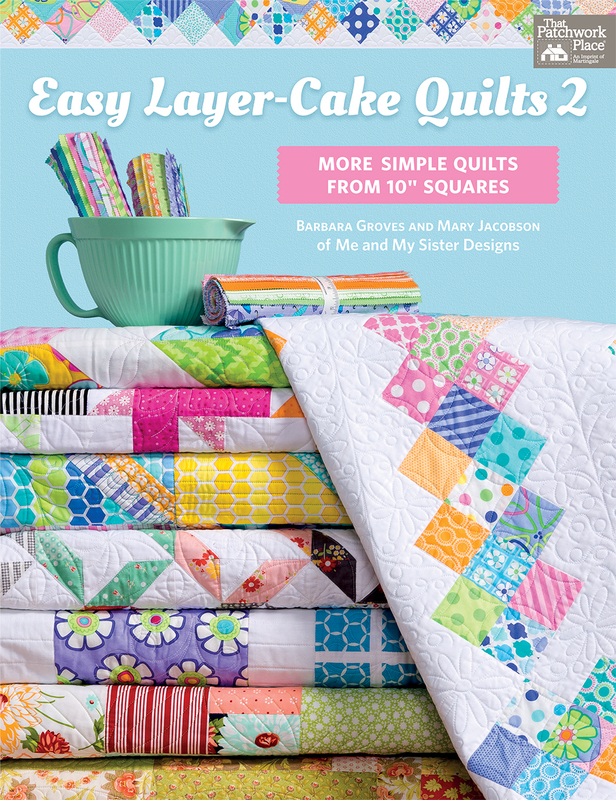 On Monday morning I will announce the winner of a copy of Easy Layer-Cake Quilts 2 (hardcopy within the US, eVersion for international locations), courtesy of Martingale. Don't forget to mention your email address (but use this format: "soandsoatinternet.com" [in other words, do not use the @ symbol opting instead for the 'at' word] so you do not get spammed!) as I will need a way to contact you. Definitely precuts. Looks like a great resource. Lots of precuts! Love the convenience! 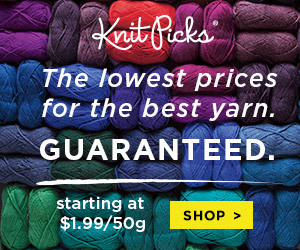 I am mostly a yardage or FQ type of quilter in terms of buying. I also love lots of colour! LOVE precuts! I would love to have a book full of patterns to give me more ideas on how to use them. I have to say that I buy yardage and precursors equally. I have 3 layer cakes with no ideas for quilts... this book would be awesome!! My fingers are crossed. I mostly buy yardage. I love to pick my own fabrics. I have made one layer cake pattern, but I created my own cake! Please don't ask how large my curated collection is! Thanks for the giveaway. Aqui no Brasil compro em metros;Agora descobri uma loja de fabrica em Juiz de Fora MG.Voltei a ter estoque rssrrsMas amo os meus retalhos de confecção.BEIJOGRANNNNDE!!! That's a toss up. I would say it really depends on what I am going to be making. I most often buy yardage. I do like precuts to get a sample of the whole collection. It’s about 50/50. Just depends on my plan. No plan? Then precuts all the way. I have quite a few precuts including several layer cakes for which this book would be great, but my yardage stash is way bigger. I mostly buy yardage, but the precuts are hard to resist. I purchase more fabric than precuts. I do love those precuts and use them often when quilting. Thank you for the chance to become a winner of that Layer Cake Book. Lots of great quilt patterns. Great eye candy! I buy both, but I really LOVE pre-cuts! I suppose I buy more precuts as I tend to be a scrap quilter, and I just love having patterns to use them with. Looks like a great book for any quitters library! Thanks for sharing the chance at the giveaway too! I am an equal opportunity purchaser! I love fat quarter bundles and layer cakes, but buy yardage for backgrounds (usually 4-5 yards). Thanks for the chance to win! Precuts. I love getting a whole line of fabric even if it is a charm pack. Pre-cuts. Lots and lots of pre-cuts! I usually buy yardage but I do buy precuts. They are a lot easier for a lot of quilts! I do buy yardage much more...the way I started out, I guess, but love the pre cuts too! Pre-cuts mostly, but need White+Cream by the bolt. Thanks so much for your Blog+a sweet giveaway too! I am a precut girl. I like to purchase precuts with extra coordinating yardage. I purchase fat quarters and yardage. I usually purchase yardage along with a few fat quarters. Thanks for the opportunity to win your giveaway. Maybe that will get me started using layer cakes. I purchase yardage about 75% of the time. Thanks! I probably buy more yardage than pre cuts but I have my share of pre cuts too! Thanks for the chance to win the book! 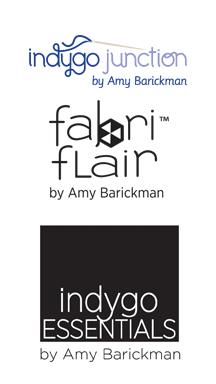 Great on buying both, but tend for yardage cuz I never know what I will do with a fabric I love. Daybreak is my fav to show of some of the "loved fabrics" Around the block makes me smile with all the colors. I've only used yardage only because precuts not available in this part of the world. Would love to be entered for this giveaway. Great book! I think it's probably a toss-up, but I will say I buy a little more precuts. I buy more yardage but I don't lack for precuts. I buy a lot of them too. This book looks like a great resource to have. I usually like to buy yardage so I can pick the fabrics I really like, but if I can get it for the same price on sale, I prefer precuts so that I can get a large variety quicker. My older stash is mostly yardage. 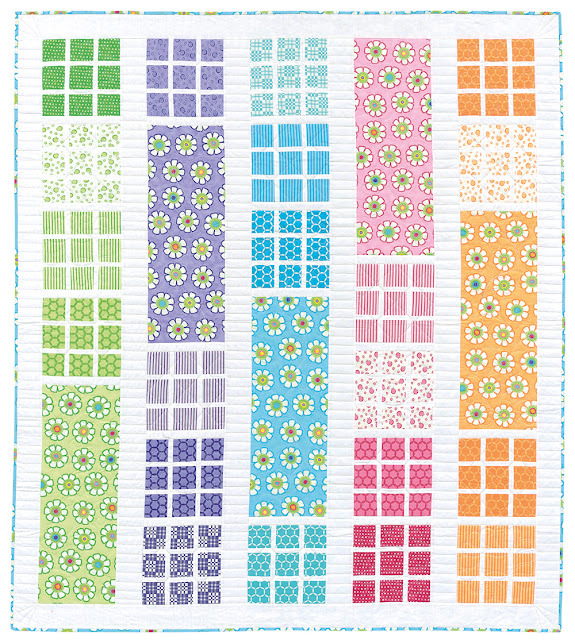 I enjoy scrappy quilts now, so I have been buying precuts. I love the quilts you showcased from the book. I like precuts as well as kits. Thanks for the fun. I buy both but recently I like to buy precuts. I have made quilts for both of my great granddaughters using Jelly Rolls. Probably yardage but I have a lot of precuts too. Thats a darling quilt. Probably yardage but I have lots of precuts too. I love to use layer cakes, you get such variety for not as much $ as fat quarters. Thanks. I think FQ's and yardage are purchased equally. I like fat quarter bundles! A year ago, the only things I purchased were pre-cuts, but now I am starting to tip the balance and buying a fair amount of yardage. It's about 50/50 now, because who can resist the wonderful balance that pre-cuts provide? Love them! I love flipping through the pre-cuts seeing all of the different prints. 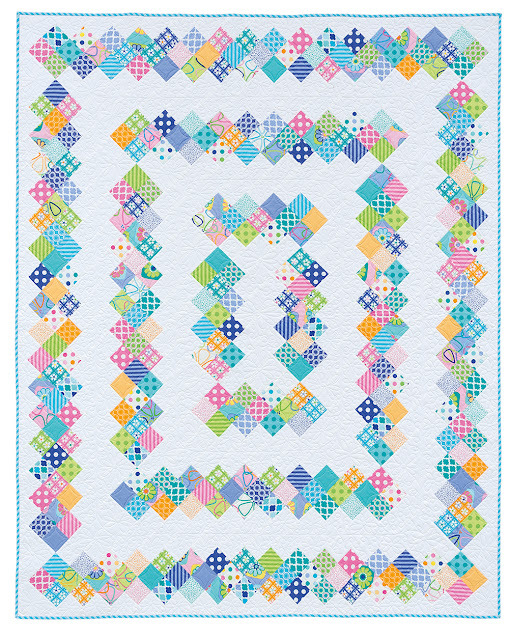 LOL I buy according to what I need, but I love precuts for quilts for sure! Just yardage because precuts are not available here.